As electricity invaded American homes in the 1920s, everything imaginable was becoming electrified. From electric clocks and coffee percolators to electric dishwashers and stand mixers, every gadget was going electric. 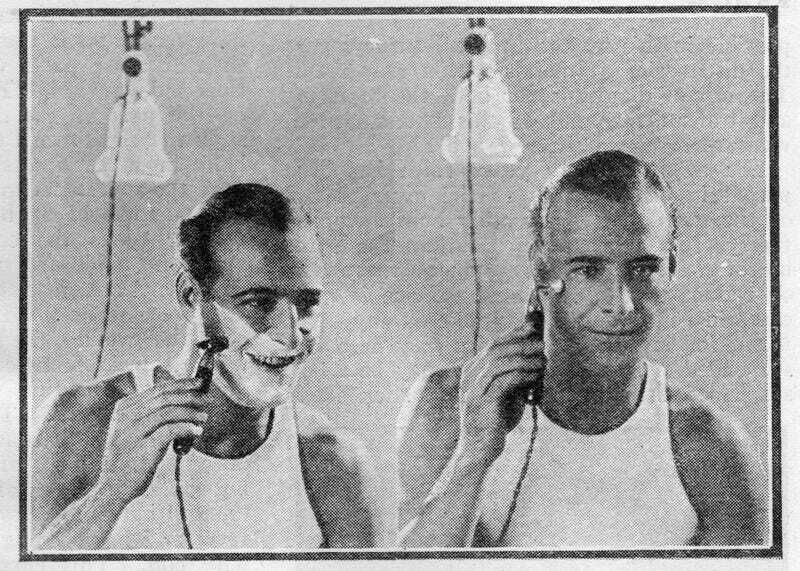 Even the sacred ritual of shaving one's face was getting the electric treatment, as you can see in this early version of the Vibro-Shave electric razor. The March 1926 issue of Science and Invention magazine included the photo above and the illustration below, showing off just how the new Vibro-Shave worked. Under the headline, "New Devices at the Electrical Show," the magazine touted the benefits of electric shaving. With the twist of the bottom knob, the device would start vibrating and the razor blade inside would move from side to side. It was so easy, even a heavily bearded child could do it. And it wasn't just for shaving. The removable head allowed for a massage attachment (seen in the photo on the right) which was promoted for use on both the scalp and the face. "It does not rub in wrinkles," the booklet that came with the gadget proclaimed, "but, by the gentle tapping with the vacuum tip, coaxes them out." It wasn't just for men either, as you can see from these ads in the March 1926 and April 1926 issues of Popular Science magazine respectively, which explained that many women, as well as men, had "discovered the satisfaction of using the Vibro-Shave Electric Safety Razor." The electric razor was still decades away from becoming a mainstream hit, and this Vibro-Shave razor wasn't the first. The first experiments with and patents for electric razors date back to the 1890s. But it's fascinating to see that one of the earliest commercially released electric razors wasn't marketed necessarily as being gender specific. Today, personal hygiene products as simple as soap (let alone razors) are marketed as "for men" and "for women," arguably to the point of parody. Antique electric Vibro-Shave razors are up for auction on eBay (pictured below) if you're so inclined to buy one. Though if you're brave enough to not only plug that thing in, but to press it against your face, consider yourself a bolder person than I.